Beard, David (Bowdoin 1988), originally uploaded by BowdoinCollege. 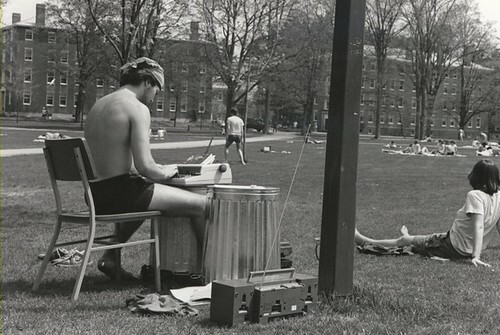 Going wireless on the quad - circa 1988. David Beard, whoever you are, rest assured you were awesome in college. 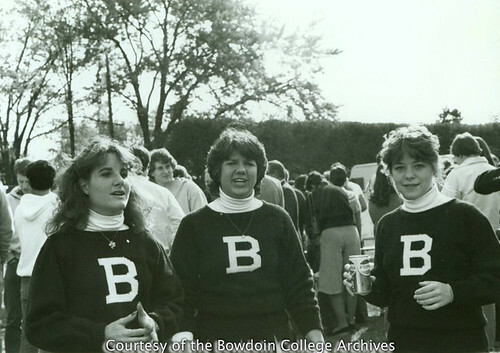 Cheerleading 1985, originally uploaded by BowdoinCollege. 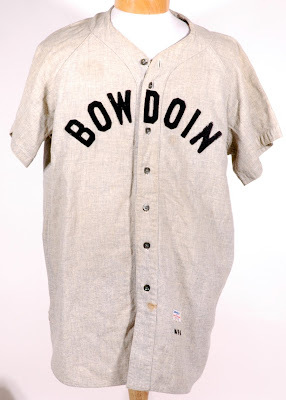 There is a "B" hat on the bookstore's website, but it says "Bowdoin" on the side, which I think hurts the purity of the look; the "B" shouldn't require an explanation. As they say about the school, those that need to know, know. Croquet Club 1984, originally uploaded by BowdoinCollege. I found what looks to be Bowdoin College's official Flickr account in my hunt for unique and interesting photos of the Bowdoin college experience. Now, as you can imagine a lot of these photographs are of recent official, sanctioned events - like graduation or athletic games - but there are some real gems from the archive that date back to the 1950's. I wonder if they are familiar with the Life Magazine archives I've posted previously? 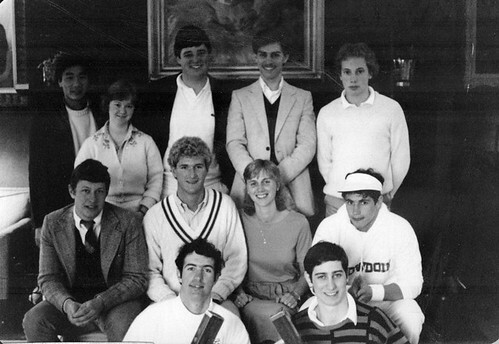 Here is one of my favorites - Bowdoin's Croquet Club in 1984. Note the tennis sweater in the center row, as well as the variety of sportcoat combos featured by the men. Lacoste polo and blazer? Check. V-neck sweater and blazer combo? Double-check. 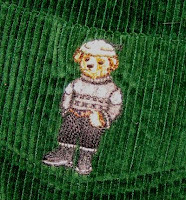 Also, one of the club members is a fellow by the name of Jeff Wicket - if that isn't a great Croquet name I don't know what is. 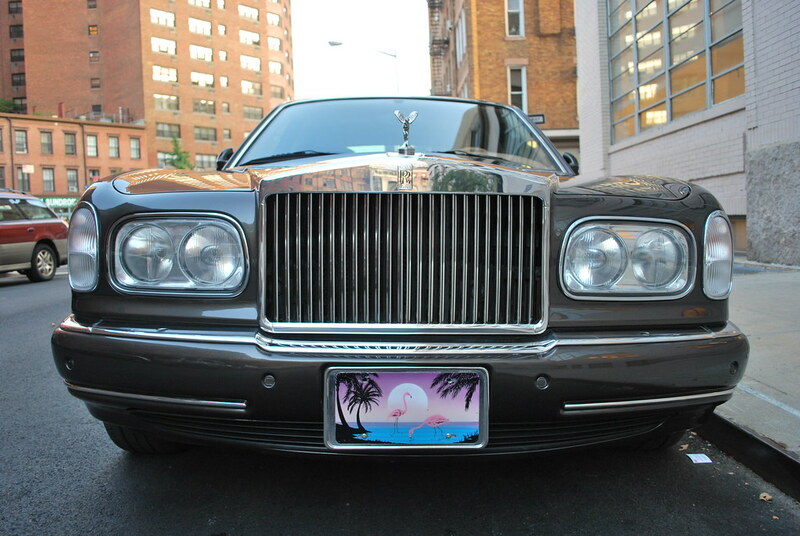 And yes, that is a Rolls. Taken near Horatio and 8th Ave. There is an "old money" joke here that writes itself. A recent interest of mine is old bank money bags - there are a ton on eBay - and thinking about creative uses for them. A couple of representative auctions can be found here and here. There is something cool about these moneybags that is more than just 'vintage' - it also represents an era that emphasized money as tangible and local, versus our globalized "cashless" economy. I've seen artisans craft old grain sacks into pillows, so I figured old money bags would make a great room accessory too. Maybe I would buy an old money bag, then get one of the grain sack pillow makers to create my custom pillow for me. I mean - how genius is that? Looks like someone on Etsy already beat me to the puch. Guess I wasn't onto something wholly original after all! The bags by the artisan are really top drawer. 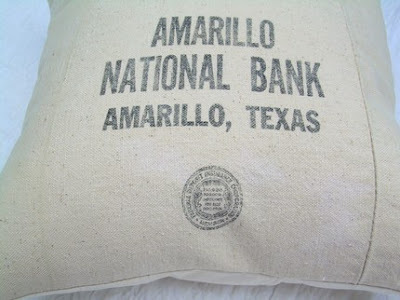 Even the choice of the bag - Amarillo National Bank - just sounds cool. And the price of $22 is pretty unbeatable. You can check out the rest of Leslie Janson's vintage textile goods at her Etsy website. Last week I took an afternoon constitutional (to borrow a phrase from Fred, DP’s Washington D.C. correspondent and counsel) to check out the new Brooks Brothers “boutique” store on Sixth Avenue. Ever since the announcement of the store I was excited – a quick trip to Brooks was only a few blocks away during the workday! Should I need to satisfy a burning desire to pick up a pair of Peal & Co Cap Toes, well, I was quite prepared for the emergency situation. Then I heard the news that this would be a Brooks “boutique” – and naturally my heart went a-flutter. Would they offer vintage Brooks looks? Would they have a selection of the Thom Browne Black Fleece collection? Were they taking a page from J. Crew’s successful “liquor store” in Tribeca, offering a specially curated collection only available at that location? Needless to say my expectations were running at fever-pitch. I don’t get this worked up unless the Crate and Barrel AND Pottery Barn catalogs arrive on the same day. …found a “boutique” with all the charm of an airport duty-free shop. Now I suppose in the end this was a business decision – keep the Brooks flagship on Madison, kill the store on Fifth Avenue, save money on rent, and open up a “boutique” nearby one-sixth of the size of the old store on Fifth. OK I guess – but the Sixth Ave boutique and Madison locations still aren’t that far away. I can understand the rationale of having multiple locations – but keeping them so close must surely cannibalize sales (and I’m sure it was even worse back when they had the Fifth Ave location). That aside, I’m more disappointed in the wasted opportunity here. J. Crew has done some really creative work in extending and revitalizing their brand as evidenced in their smaller boutique stores in New York. What was once a “mall brand” along the same lines of an American Eagle in my head has turned into a hip destination fully aware of classic men’s style (Baracuta & Barbour jackets, Red Wing boots, etc). Brooks could have done the same thing – perhaps using a better thought-out “boutique” as a means to answer the critics who note the store has gone hill ever since its ill-fated acquisition by Marks & Spencer. "I want to go to Princeton," said Amory. "I don't know why, but I think of all Harvard men as sissies, like I used to be, and all Yale men as wearing big blue sweaters and smoking pipes." 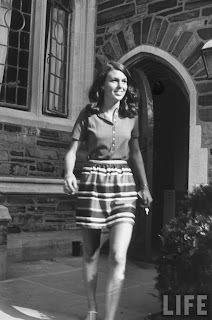 There is a lot on the internet for men's collegiate style in the 1960's - think of Take Ivy for instance - but very little about the girls (of that which I'm aware). I suppose this is natural, many elite colleges had yet to go coeducational at that time. 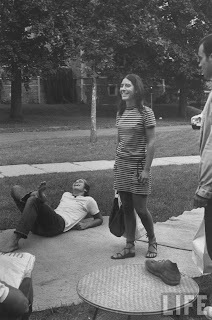 So it was great when I stumbled upon these images from the treasure trove of the Life Google Archive, documenting Princeton University's first "coeds" in 1969. There are some great shots here, and my woman's fashion correspondent (my girlfriend) notes that several of the outfits could still pass today - such as the dress & gladiator sandals combo. This isn't in my wheelhouse when it comes to fashion knowledge, but I think the images are fascinating nonetheless. A few selected images below. The rest can be found on Google's Life Archive. --Walt Whitman, "Crossing Brooklyn Ferry"
However, when I step upon the train, my thoughts travel back to Walt Whitman’s “Crossing Brooklyn Ferry,” Uncle Walt’s famous meditation on the faces of the ferry crossers, and those who have or ever will take the ferry. I came to the Whitman appreciation camp late in the game, well after college. It was this poem that finally won me over, specifically the line, “I consider’d long and seriously of you before you were born.” For when I read this line I felt an jolt – the electric moment when you feel that Whitman is speaking directly to you (along with the acknowledging revelation that this moment connects you to all the other readers before you who felt Whitman speaking to “them” as well). Doty is hardly an inaccessible poet – but in my reading of his work I’ve found that he rarely addresses the reader directly. So now I’m wondering, was Doty purposefully channeling “Crossing Brooklyn Ferry” in his poem “Oncoming Train”? Was he thinking about Whitman and the way he speaks directly to us? Is that the inspiration for the confession to the reader? It is not hard to imagine – Doty owes a great debt to Whitman as an influence, and even writes a poem about seeing an apparition of Whitman in Fire to Fire, his selected poems collections. So while I’ll probably never figure this out (unless I ask Doty specifically), for now on I’ll consider these poems intertwined whenever I see the “crowds of men and women attired in the usual costumes,” on my subway ride to work. Preciousness. It describes the West Village pretty well. Because when you take your morning espresso and croissant at Doma, lunch leisurely at Tartine after a taxing morning of shopping on Bleecker - well, His & Hers Towels just aren't going to cut it. What you really need is His & Her's Vespas. Photograph taken from my stoop - apologies for the poor quality, but I only had a quick second to capture it. A completed auction from about two weeks ago. My max was $85 as I didn't think it would go any higher. Whoever pony'ed up $200 for this one, congrats, you deserve it. While driving up to Maine for a short holiday weekend, I saw this car on the highway and just had to take a camera phone picture. 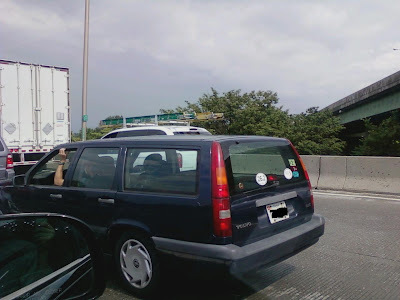 As I noted in my previous exploration of the crunchy-prep phenomenon, "Hiking in Madras," Volvo and Suburu station wagons are definitely crunchy-prep. occasions... the list goes on) are most definitely crunchy-prep, as well. Unknown crunchy-Prepster, I salute you. I’m naturally suspicious of mission statements – of the corporate variety, at least. They strike me as a means to institute top-down cultural values where these values should instead originate in a bottom-up manner, bubbling up the corporate hierarchy and silently informing the company’s ethos. Moreover, the statements become lazy heuristic shortcuts – the type middle-managers reflexively recite and tether their thoughts around, instead of thinking deeply and critically about the business and the nature of their work. That said, some ten posts or so into this website, I am starting to wonder natural thoughts such as where is this thing going?... The type of thoughts that lead instinctively to a bullet pointed and power-pointed mission statement. Now I avoided the typical first post you see on blogs on purpose (the type that announces why you are writing and your directions, et cetera) because I first wanted to see how my posts shaped up, and if there was any discernable trend. So, basically, two weeks later: there is none. Of course you can group the posts so far around the three P’s – (Prep Clothing, Photography, Poetry & Literature), but there is hardly any unifying theme other than these are subjects I enjoy. Loosely, I suppose, you could say this is a website about aesthetics – though such a big tent definition is hardly useful in comparing my aesthetic sense with anyone else’s. I’ve come around to the notion that this can be free-for-all of sorts, a virtual bargain bin of ideas and shards of thoughts that, much like the business of Citigroup, are worth more on their own rather than as a whole. In other words, the point is not to have a point, seeking not to fill a niche but rather graze casually, parsing out my mind’s flotsam and jetsam to a wider audience. You can say then, that this website, to paraphrase William F. Buckley, stands athwart specialization, yelling stop. I once joked that with my friend Mike that we should start a country-shoegaze band. Pink Mountaintops isn't joking. Check out the video for the band's latest video. Who knew twang and reverb could sound this good? Video is gorgeous, too. It's like Robert Palmer's Addicted to Love video goes to Williamsburg. Most of my friends know my interest in go-to-hell sport coats from the frequent coverage I give them on my facebook posts. Why GTH sportcoats? Because they're even more aggressive than GTH pants, that's why. Anyone can get a pair of weathered Nantucket red pants from Murray's Toggery Shop, but it takes a special (some might say very special) person to don a wild sportcoat with a straight face. Here are a couple of go-to-hell sportcoats from Thom Browne's sale a few weeks back on Gilt. My personal favorite is the Maroon Madras Blazer - nothing that crazy, I know - but I'm a traditionalist when it comes to my go-to-hell sportcoats. Go figure. When evening comes, I return home [from work and from the local tavern] and go to my study. On the threshold, I strip naked, taking off my muddy, sweaty work day clothes, and put on the robes of court and palace, and, in this graver dress, I enter the courts of the ancients, and am welcomed by them, and there I taste the food that alone is mine, and for which I was born. And there I make bold to speak to them and ask the motives of their actions, and they, in their humanity, reply to me. And for the space of four hours I forget the world, remember no vexation, fear poverty no more, tremble no more at death; I pass indeed into their world. I'm currently reading Allan Bloom's The Closing of the American Mind. In it, Professor Bloom references Machiavelli's quote, though in a far more watered-down form. I tracked down the original, which is above. While I have a post planned regarding The Closing of the American Mind (in relation to Shopclass as Soulcraft, which I just read as well), the above quote is strong enough to stand alone. No commentary needed. Just enjoy. More good finds from the Life photo archive on Google. Looks like this photo was taken near the current day Art History library, guessing by the location of Massachusettes Hall on the right side of the frame. I wonder when Bowdoin took out the seats built around the trees? What a shame, they look pretty neat. Even better are the guy's loafers. LL Bean or Quoddy moccasins? Not sure. Regardless, pretty classic. I also like the terry cloth polo shirt. What are they reading? I bet they're reviewing a list of chants for the upcoming Bowdoin/Colby hockey game. "Here lies one whose name was writ in water." Can we distill Keats - his life, the essence of his career - to one sentence? If it is possible, Keats, of course, out-did us all in that attempt. Composing an epitaph that is both touchingly beautiful and perversely macabre, it captures the transcience of Keats too - his fragile physical body that ultimately succumbed to TB at age twenty-five. It is hard to write an epitaph like this without an acute awareness of one's own mortality, and surely it is a strange state for one to embody, living one's life while constantly walking a tightrope of death and sickness. This ethereal quality of Keats - the sense of feeling trapped between worlds - is one of my favorite images of his. He captures it in Ode to a Grecian Urn*, where he describes the youth in the urn as trapped in the climactic moment of waiting for his lover's kiss, as the speaker consoles the youth: "...yet do not grieve; / She cannot fade, though thou hast not thy bliss, / For ever while thou love, and she be fair!" The lover is eternally caught before the moment of innocent consumation - though his lover retains her perpetual beauty. Reading Keats' "La Belle Dame Sans Merci" last night, I saw the imagry again, and thought of his epitaph. The Knight in "La Belle," like the youth in the Grecian Urn, is dejected: "And this is why I sojourn here /Alone and palely loitering" in the thrall of the lady. Regardless, he still occupies an unknown no-man's land in the "cold hill's side." I'm sure Keats saw a lot of himself in these two figures - caught between the spheres of life and death. Bestriding two worlds like a Collosus - surely that is an apt description for poetic genius. *I owe the Grecian Urn insight to my former Shakespeare Professor, Bill Watterson. In one of his best posts ever, Trip from A Trip Down South offered cheaper alternatives to the J Crew Timex military watch offered for sale last Christmas by J Crew. His original post can be found here. Thanks to Trip, I created my own military-style watch for about $30 using a US Time watch and a reversible watch straps that you can get at places like J. Press (I got mine from from the terrific John Hyatt shop in Summit, NJ). Way better than dropping $150, and more distinctive too. So in the spirit of Trip's post, I'm starting another feature on DP called On the Cheap, focusing on ways to get fashion gear - you guessed it - on the cheap. My inspiration today comes from the Rogues Gallery S/S 2010 collection previewed today on ACL. Rogues Gallery featured two very plain duffel bags as well as a rugged looking tote (third and fifth picture on the ACL link). Now, prices are not listed, but if I had to guess I would estimate they'll retail for anywhere between $100-$300, based on current prices for bags at Rogues Gallery. A far more economical - and still Maine based option! - is to get your stuff through Port Canvas in Kennebunkport, ME. Going by the uh, remarkable simularity between the Rogues Gallery bags and the Port Canvas bags, I'm guessing the Rogues Gallery guys are big 'port fans too. Port Canvas offers a variety of different bag styles - all customizable and monogramable - for reasonable prices that will set you back in the range of $40-80. The closest approximation to the RG bags are the Cruiser and the Shellseeker. Frankly, Port Canvas is a better deal. So you can spend the money you save on your totebag purchase on the upkeep of your small yacht, Pup. Hiking in Madras: What, if Anything, is Crunchy Prep? I once posted a comment on Michael Williams’ A Continuous Lean on the subject of Carhartt workwear clothing, as I’ve had my Carhartt duck jacket since prep school. While praising the jacket, I noted the company’s popularity at Bowdoin and without much thought, labeled the look: crunchy prep. B-B-B-B-B-Brooklyn! Vanessa Abrams to my Blair Waldorf! Most Un-Prep! A little stung at first, though over the course of the day the wound healed into a beam of pride: unwittingly I struck a nerve! A quick Google search revealed that the apparent neologism had little traction on the web, which lead me thinking, what is Crunchy Prep? While I am no expert in the subject (my camping experience is limited to a pre-orientation trip, whereupon I noshed on GORP and annoyed my fellow campers by relishing in immature prep school stories with my friend Whit), I think there are a few specific items in the satellite of the Crunchy Prep universe. Looking back, it’s stunning how similar “crunchy” prep walks and talks like the preppiness as cataloged by Lisa Birnbach in The Official Preppy Handbook back in the ‘80s, or the 1960’s crew-cutted shots from Take Ivy. Why is this? Do crunchy preps simply carry the torch for the OPs – Original Prepsters? Or is this unique movement? I think yes and no. Just like “Crunchy Conservativism” as articulated by Rod Dreher traces its organic, vegetable-fed roots to Edmund Burke and other Conservative touchstones, “Crunchy Prep” hugs tightly to its prep-progenitor – namely in the outdoors-as-indoors clothing aesthetic and wind-swept sprezzatura guiding its entire ethos. You might even say Crunchy Prep is the truest expression of the (early) Prep style, since the pastel-gauche-fantasia palette of Vineyard Vines seems to have hijacked the look for the moment. That said, I think the double-reinforced Carhartt pants (paired with a weathered polo for the ultimate ‘uptown/downtown’ look), along with the enviro-centric politics is really unique to crunchy prep. Am I totally off here? Am I missing any other crunchy prep items? Or is this ridiculous over-analysis just mean I’m pining for my time under the – wait for it...! – Bowdoin pines? In honor of Shark Week, the Discovery Channel's annual weeklong series of television programs devoted to sharks, Poets.org has compiled 35 Poems about Sharks, and examined how the animals have been represented in classic and contemporary poetry. Even in the first five words, I knew this sentence was a winner. In honor of Shark Week... Because, I suppose, it is some sort of religious holiday, and we-must-genuflect amidst the awesomeness of (the honorable!) Shark Week. Beyond that, though, the absurdity rang through - the Academy of American Poets and... Shark Week? Please insert a Scooby-Doo "Arrrguuugh?" reaction here. Perhaps an early frontrunner for the most bizzare PR mash-up of the year. Though, this is the wrong way to think about this, I realized later. Poetry is, after all, the red-headed stepchild of the arts. While visual artists, muscians, actors, novelists enjoy mainstream critical (and sometimes commercial success), poets occupy a perceptual corner somewhere along the lines of "cute". Needless to say, you don't go into poetry for the money. Part of this is the Academy's own doing. Most of contemporary poetry doesn't engage a modern reader. It's obtuse and written by creative writing instructors for other creative writing instructors. So back to Shark Week and the Academy of American Poets. Is it ridiculous? Yes. Is it improbable and slightly bizarre? Absolutely. But it's a good thing, over all. Anything to get people reading more poetry is a net positive, and anything to push poetry beyond the archetypal New Yorker entry (Oh look! CK Williams wrote about Death!) and into our mainstream awareness and everyday cultural dialogue is better - even if it tags along with Shark Week to do so. I have a love of industrial sites - specifically factories, mines, etc - that grew out of an Aesthetic Ideologies seminar in college. The photographs by Charles Sheeler of the Ford River Rouge plant are simply transcendent in the way they elevate America's fascination with early assembly-line factories into images of religious ecstasy; the metal press as an altar, smoke stacks as organ pipes. I stumbled upon the following images in an interesting fashion. There was an article in the Financial Times about a mining company resuming production in Zimbabwe after the power sharing deal between Mugabe and Tsvangirai. The article combined two of my random interests - Zimbabwe and international mining companies. Why an interest in mining companies? I don't know, perhaps it is because I like how Rio Tinto sounds when you say it out loud (it's an Australian mining conglomerate). I decided to do a little more research on the company, Mwana Africa, and found some breathtaking images of their mining location in Zimbabwe. It's a fascinating juxstaposition of industrial organized chaos against a verdant mountainous countryside. 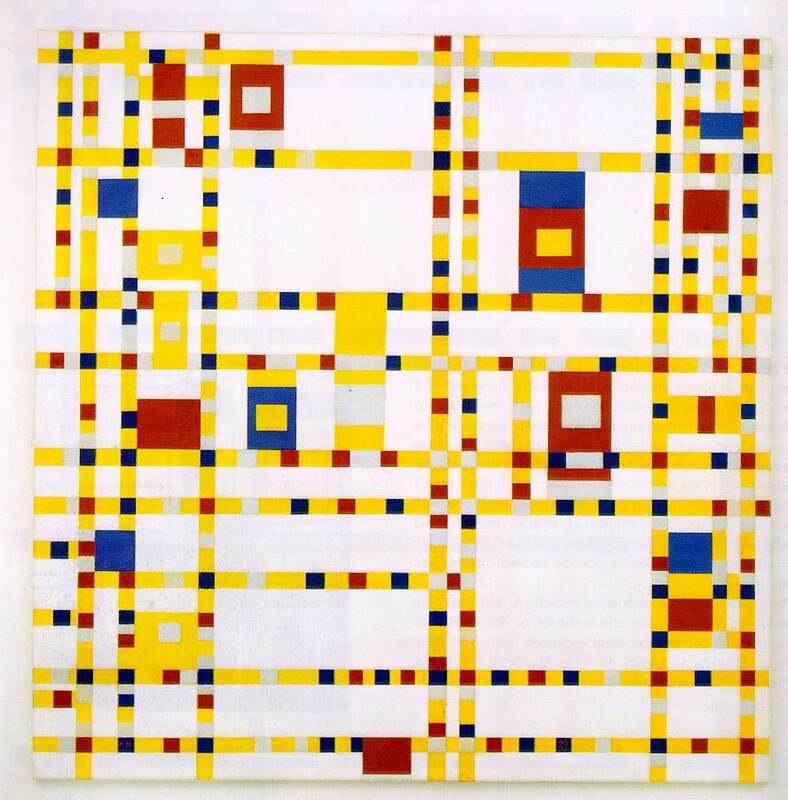 The bright colors and alternating horizontal and vertical lines remind me a lot of Piet Mondrian's most famous compositions, and specifically "Broadway Boogie Woogie." A few more pictures of the mine are below, as well as the Mondrian for comparison. The images of Mwana Africa's mining operations can be found on their investor relations website. The dominant influences on F. Scott Fitzgerald were aspiration, literature, Princeton, Zelda Sayre Fitzgerald, and alcohol. I remember coming across this sentence ten years ago. There is something beautiful in the expanse of it, despite its obvious brevity; its romanticism undercut by tragedy. It features the School, the Girl, and the Vice. What more does a writer need?